Winning form is good form, so says trainer Cameron Crockett, when you’re trying to gain exposure for a low-profile contender for the $1.3 million The Kosciuszko (1200m) run on Everest Day. 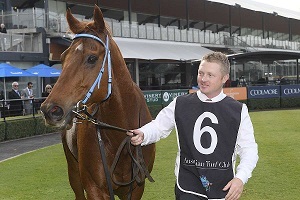 So with that in mind the Mudgee trainer is keen for in-form sprinter Sharpe Hussler to be his own best Kosciuszko advertisement by posting back-to-back city wins at Royal Randwick on Saturday. “Sharpe Hussler doesn’t have the advantage of previous form getting him into the (Kosciuszko) so he really needs to strike again,’’ Crockett said. Cameron Crockett with Sharpe Hussler (Pic: Bradley Photos). “He was $101 before he won at Rosehill then he came into $51 and he’s into $26 now and to me that says there’s some kind of focus on him. Current TAB favourite for The Kosciuszko is Magic Millions Cup winner Care To Think ($4) and the top of the market is filled with horses with profiles through Group races or the Country Championships series. Sharpe Hussler tackles the Forum Handicap (1000m) at Randwick, three weeks after running the fastest last 600m of the day (33.18 Punters Intel) in his last appearance at Rosehill. Crockett said he had originally planned to wait until next week’s Rosehill meeting for the seven-year-old’s next run but believes he’s found the right race. “I looked at the field and for this time of year we’re very lucky to have struck a field with that depth,’’ he said. TAB has Sharpe Hussler on the third line of betting at $7.00 (as at Thursday) for Saturday’s race behind Almanzora ($2.40) and Brook Magic ($3.80). Crockett took over the training of Sharpe Hussler early last season and while he did win at his second start for the stable it took some time for him to really settle in. “When I first got him I think he was lacking a bit in confidence,’’ he said. “At the time I was still riding trackwork and he felt terrible, I thought they’d sent the wrong horse. As far as The Kosciuszko is concerned, Sharpe Hussler is Crockett’s only realistic shot at securing a runner but that ultimately comes down to who wins the slots in the ticket draw on September 14. He considers stablemates Nictock and Ori On Fire as good enough to be competitive but both horses are only at the three-quarter pace stage of their preparations and would fall into the ‘out of sight, out of mind’ category to potential slot owners. “Over the next little while you’re going to see a lot of horses that people weren’t really considering come up,’’ he said. “The way it works, if someone from our area happens to win (a slot) and they see Sharpe Hussler they might be inclined to pick him over a horse they don’t know. The $5 tickets for The Kosciuszko Sweep and Calcutta are widely available through TAB online and betting terminals, at race meetings and in Pub TABs and clubs across New South Wales. To register your tickets visit www.thekosciuszko.com.au. On September 14 two draws are conducted, the first 12 tickets drawn win the right to select a horse and negotiate a deal with its owners for a share of the prizemoney. For the Calcutta, 12 tickets are drawn and they will represent a runner in The Kosciuszko. Winners take home 50 per cent of whatever their runner sells for in the Calcutta on Friday October 12.